*Enterprise Edition uses the extended Tasks feature rather than Reminders. 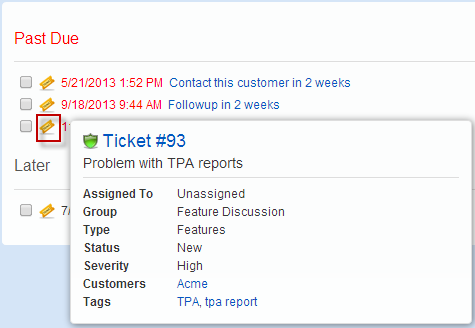 The Tasks feature allows TeamSupport users to assign and track multiple tasks for other users or themselves on a single ticket. 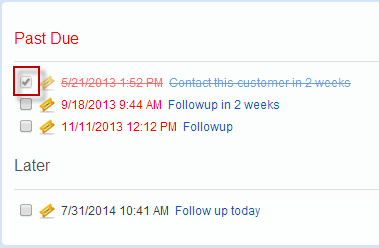 Reminders are a great way to stay on top of follow ups with tickets, customer accounts and individual contacts. Simply add a reminder to a ticket and an email will be sent to you on the due date. To view a list of your reminders, go to to My Tickets -> Reminders tab. You can mark the reminder as done and remove it by checking the box next to the reminder name. You can also hover over the reminder icon to to receive additional information about the reminder. If you click on the ticket name or customer name, it will open in a new window. Click here to learn about adding reminders to customer accounts and individual contacts.